KNEEL! You have reached GeneralZod.net | Zod on "Easter"
With each and every passing day, I simply grow more bored and disgusted with all of you - my slaves. Planet Houston appears to be a breeding ground for nothing but vulgarians and the nebbish. In addition to this, you humans have an inane need for "celebrations" known as "holidays". One of these so-called "holidays" is known as "Easter". When I first arrived on planet Houston and conquered your white house, I saw that you were already practiced in the worship of things that fly. This pleased me as your new ruler, for I did and still do fly and deserve nothing less than your unwavering devotion. However, I have recently discovered that with this "Easter" holiday, you worship another creature. A creature than not only can't fly, but it can't even shoot lasers from its eyes! The creature I speak of is known as the bunny rabbit. What kind of nonsense is this? Are you humans so infinitely weaker than your surroundings that you look up to a creature such as this? 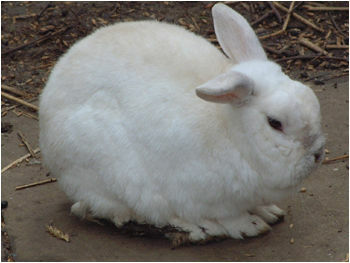 Just before killing a young school girl for defying me, I inquired about what was so appealing about these "bunnies". As I slowly crushed the life force out of her, she whimpered about how these bunnies were "cute" and "cuddly" and "fuzzy". Fools! Such senselessness cannot be tolerated! Other than their white exterior, I see no difference between these bunnies and the rodents which you call a man by the name of "Orkin" to exterminate. While I can appreciate any being who exterminates those that are weaker than he, I will not tolerate this Orkin man running around freely when he should be kneeling before Zod! Thus, I will kill him for his defiance in the immediate future. But what of this "Easter Bunny" and all of his followers? Another discovery I made is that this "Easter Bunny" likes to "hop" to travel. Clearly this hopping is just a pathetic attempt at taking off for flight, but you will never fly Easter Bunny! You will never fly! Bunny or not, I shall make you kneel before me! The first step in the subjugation of this Easter Bunny was to kill off all his beloved egg-delivering messengers. 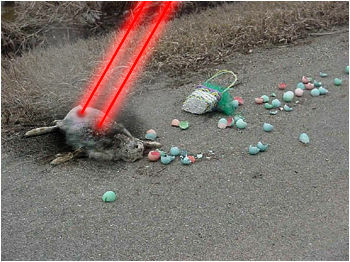 By killing off all his messengers with my powerful eye lasers, I instantly made it harder for more of my slaves to learn about this Easter Bunny. By destroying the messengers, I destroy the message they carry along with them as well. Next, I had to put an end to the secretive distribution of these "Easter Eggs" that had already taken place without my knowing. Apparently, these bunny messengers would go from town to town and hide Easter Eggs in various areas that they believed only humans would discover during an "Easter Egg Hunt". While I killed all of the messengers, some of them had already distributed their eggs and I now had to destroy them all. Did you REALLY think the great General Zod would not be able to find these hidden eggs!? Don't you know that the closer I come to an atmosphere with only one sun... a yellow sun... the more my molecular density gives me unlimited powers? Those powers include x-ray vision, you foolish rabbits! Finding and destroying all of these eggs, which I am certain contained foolishly defiant anti-Zod propaganda, was such a simple task that it only made me pity you invertebrates all the more. And the bunnies could have at least tried camouflaging their eggs rather than affixing them with garish decorations. But now these bunny rabbits are beginning to bore me. 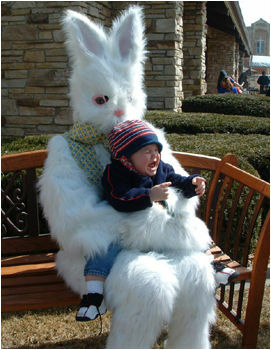 I believe it is time to exterminate their leader... the Easter Bunny himself! Finding this Easter Bunny was even less difficult than finding his anti-Zod propaganda eggs all over planet Houston! I merely had to listen for the cries of my young devoted slaves and I soon found him holding them in his arms, forcing them not to kneel before me as they were born to do! Easter Bunny, for this act of defiance against your rightful ruler, you have forfeited your life. DIE AS YOU DESERVE TO, DEFIANT COTTON-TAILED ONE!